About Us - J and H Builders, Inc. Established in 1974, J & H Builders, Inc. in now a third generation, family-owned and operated, commercial and industrial general contractor. 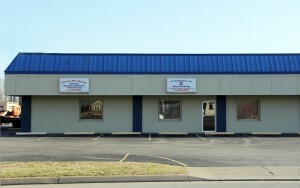 J & H Builders, Inc. started its business as a residential contractor/subdivision development company. In 1984, after ten years of residential and small commercial developments, it was decided to focus our efforts exclusively on commercial and industrial construction. Our main goal at J & H Builders, Inc. is to build strong customer relationships with our clients based on customer satisfaction and a high quality of workmanship at an affordable price. By doing so, we are able to meet and exceed our clients needs and help them meet their goals. J & H Builders, Inc. takes pride in the fact that we have qualified employees and the manpower to perform the majority of work we are contracted to do. We believe that our projects do not end at completion, but continue on for a lifetime. Jackie Hogin is one of the original founders along with his father Hudson of J&H Construction Company back in 1974. Both Jackie and Hudson focused their attention in residential construction. In 1984, Jackie turned his attention and focus into the commercial and industrial construction arenas. Since then his main focus has been warehouses, industrial facilities, multi-use centers, retail centers, office buildings, religious institutions, banks, and convention construction. Jackie has overseen many projects in his years of service to the construction business. In 1999 Jackie brought both his sons into the business, thus continuing the original foundation and commitment of this family-owned/operated business. Today, Jackie serves as CEO/Retired, having passed many of the daily works on to his sons, while remaining active in other day-to-day operations of J&H Builders, Inc. He still remains an integral part of the visioning of the company, as well as a mentor and sounding-board for continued growth and industry. Greg Hogin serves as President/Co-Owner of J&H Builders, Inc. He graduated from UT-Knoxville with a Bachelor’s degree in Human Ecology, with a Business minor. Randy Hogin serves as Corporate Secretary/Co-Owner of J&H Builders, Inc. He graduated from UT-Knoxville with a Bachelor’s degree in Business Administration.